The Zeitgeist is like a person who walks into a room and feels totally at home. “Zeit" in German is time and “Geist" is spirit. So the words literally means “spirit of the time." But there are, in fact, certain people and cultural artifacts that reflect the Zeitgeist of a time. Camus’s The Stranger, a book, by an obscure French intellectual, who had edited the resistance newspaper Combat, became a publishing phenomenon in 50’s America. Bob Dylan epitomized the Zeitgeist of the 60’s. He would have several other incarnations which would make him at the very least a fellow traveler in the Zeitgeist of the 70’s, 80’s and 90’s. 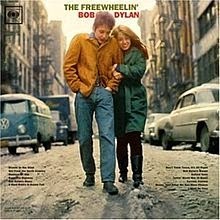 However, that first album, The Free Wheeling Bob Dylan (which included songs like “Blowin’ in the Wind” and “Masters of War,”) with the picture of him walking down the street, a guitar strapped over his shoulder and his arm around a pretty girl was like the concept of a first cause in philosophy. Today Lena Dunham's Girls seems to be a candidate for Zeitgeistmeister, to the extent that it portrays a whole post-modernist generation who have majored in ambivalence and see all of life as a work of meta-fiction in which reality has been mirrored so many times that it’s been reduced to chards of relativity. Opportunistic art entrepreneurs are always on the look out for the next Zeitgeistlich writer, artist or musician, but it’s hard to predict what the Zeitgeist will be since the pupa of its essence is often embodied in a personality like a Dylan whose imagination is like the ignition on an explosive device. Does Karl Ove Knausgaard reflect the Zeitgeist of Norwegians since one out of 8 of his countrymen own Min kamp. The book's incipient provocativeness seems an unlikely candidate for the Zeitgeist of a nation with such a reserved façade? Is the popularity of Fifty Shades of Grey a reflection of the Zeitgeist or is E.L. James’s novel merely a clever manipulation? Salinger, David Foster Wallace, Annie Lennox and Sting all reflected the Zeitgeist of their respective times, as did Picasso, Jackson Pollock and now yes Damien Hirst? In the political sphere, do the beleaguered Barack Obama, the arrogant Vladimir Putin or even the horrific ISIS reflect the wobbly nature of our globe? And has our age become too complicated to produce philosophers like Plato and Aristotle whose tomes emanated an eternal Zeitgeist, however oxymoronic, that ultimately could tell us how to live?